We've seen the back cover of the upcoming BlackBerry A10 Aristo photographed in comparison photos with the back of the all-touch BlackBerry Z10. Now a number of new pictures have been leaked showing the LCD screen, digitizer assembly, bezel and back cover of the A10. Not only is this the model that excites BlackBerry CEO Thorsten Heins, it is also being called the most powerful BlackBerry model ever. A spec sheet that allegedly came directly from the Canadian OEM shows specs that many would call mid-range these days. A 5 inch screen is new ground for BlackBerry, but is old hat for Android. A dual-core processor is so 2011-2012. And an 8MP shooter on the back of the phone is certainly nothing to jump up and down about. According to the source, the battery cover on the BlackBerry A10 is studier than the one on the Samsung Galaxy S4 and has 3 speaker holes on the top and the bottom. Among the pictures we have for you below is one that compares the bezel on the Z10 to the bezel on the A10 and you can see that at least in this aspect, BlackBerry is keeping up with the times. We expect to see the device launched in November, most likely in time to catch the holiday shopping season. 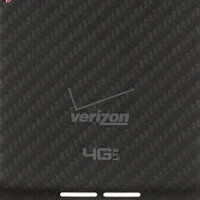 We'd also like to point out that the Verizon brand can be seen on the back of the A10 battery cover compared to the AT&T logo seen on previous shots. I think Blackberry would of had a better start with BB10 if they'd released this before the Z10. And what's with all the hate, Alan? I know that BB isn't the best platform, but did you really have to bash almost every aspect of the A10? I mean, a dual-core professor for BB10 isn't that much of a setback considering that it isn't has heavy loaded as Android. Yeah, the professor has a PhD on cores...:D Jokes aside, now that we've seen Android go beyond the 5' race, it is easy for anyone who loves the OS to the core to do that. It's not hate per se; it's equal opportunity put down. Hashtag, you should join the club. I don't see the writer's here putting down Windows Phone's that have Duel core handset's for having, well, dated specs compared to there Android competitors. All other writers were defending dual core processors for WP8 because it doesn't need quad core processors to run smoothly. same goes for BB10, it doesn't need quad core processors to run smoothly so why use them. You don't need to hate on BB for doing what they need to do to save money. If Performance isn't affected than don't bash them for it. Quad core CPU's and GPU's aren't just about performance increase. I've said it once, and I'll say it again. The S800 is faster, has a higher clock speed, and yet, is lighter on the battery than the S600 (Just see every article about the S4 LTE Advanced compared to the Normal S4). Just because you use Quad Core doesn't mean you give up battery life, or that all you gain is performance increases. Hell, if anything, Battery life goes up from using a newer chip architecture (where has the older chip architecture is less efficient), the OS becomes even "smoother", developers can make more graphic intensive games (and CPU intensive things like Nokia's Pureview camera will work faster. [there are some articles and video's reporting that the camera on the Lumia 1020 lags a bit when you try to do multiple things at once, aka fast switching between settings. Though, software updates might fix that]), and you get bragging rights. Not exactly a bad thing, right? Not to mention that, the smartphones of today are using the same size battery has those of yesteryear (because, apparently, "thinness" over rides practicality to manufacturers), and yet they keep generally the same or better battery life. Having better chip's doesn't necessarily mean you have to give up anything. wow BB Novenber is too late. Their will be better hpones coming out before that. BB is so done. The A10 seems more and more likely a competitor to the Motorola Droid Ultra, X Phone and Nokia Lumia 1020 in terms of midrange specs, at least we know with the Lumia 1020, Droid Ultra Maxx and Moto X there will be a distinguishing feature for each model. BB10 on a bigger screen should actually work well, look forward to what new features the A10 brings, but surely this can't be the saviour device just like they said with the Z10. They need a true flagship Phablet Xperia Z Ultra rival to sit above the A10 and increase the screen size to 6 plus inches to possibly replace the Playbook, which is now collecting dust on my table! the back really looks like a motorola back.. I will happily put myself in the vast minority. I enjoy BB10. It is a fun, advanced OS. The 5" screen is nice. I hope this is the device which keeps BlackBerry viable. Hope is free. Real original BB I wonder where they got that design from. If Motorola was owned by Apple BB would have a lawsuit on their hands. BB nedds to realize their consumer base is either dead or have already switched to iOS. Idk why someone would even consider an OS with no apps. Well, my Z10 works really well with specs not considered mind blowing. It comes down to the operating system for me. I really think the A10 has a chance to impress. Time will tell I guess?